WASHINGTON, Dec 16 2013 (IPS) - The U.S. government announced Monday it has repatriated two Saudi detainees held at the Guantanamo Bay prison, less than two weeks after two Algerian detainees were likewise sent back to their home country. Saad Muhammad Husayn Qahtani and Hamood Abdulla Hamood have reportedly been transferred from the military prison to Saudi Arabia, even as U.S. lawmakers debate legislation that supporters say would ease the Barack Obama administration’s efforts to definitively close the detention centre. “The U.S. has made real progress in responsibly transferring Guantanamo detainees despite the burdensome legislative restrictions that have impeded our efforts,” Paul Lewis, the Pentagon’s special envoy for Guantanamo’s closure, said Monday. After the announcement a little over a week ago that two other inmates, the Algerians Belkacem Bensayah and Djamel Ameziane, had likewise been repatriated, there are now 160 detainees left at the base, of which 80 have been cleared for release. Rights groups and experts alike here have welcomed the moves. 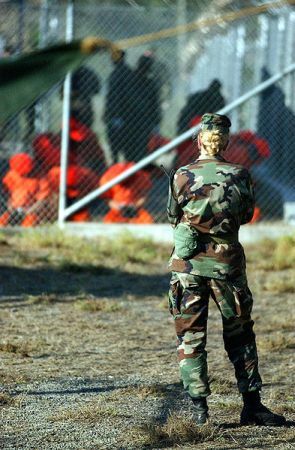 “Amnesty International USA welcomes the Obama administration’s renewed commitment to closing the Guantanamo Bay detention facility and urges it to resolve all detentions in a manner fully compatible with human rights principles,” Naureen Shah, advocacy advisor at Amnesty International USA, told IPS. The debate here has primarily focused on the implications for U.S. national security and the Obama administration’s longstanding promise to close the Guantanamo detention centre. During his 2008 presidential campaign, Obama famously vowed to close the military prison in order to improve the U.S. reputation abroad, a pledge he renewed earlier this year. That he still has not been able to do so has been attributed partially to his own timidity and partially to strong Congressional opposition. However, recent weeks have seen an increasing momentum around the issue on Capitol Hill, where the National Defence Authorisation Act (NDAA), a major annual appropriations bill, was approved by a majority in the House of Representatives and is set for a vote this week in the Senate. If passed, a provision within the NDAA would provide the executive branch with more discretion in granting transfers of detainees from the military prison, possibly facilitating the White House’s commitment to Guantanamo’s closure. “The NDAA is a sign of a shift in the politics around Guantanamo, providing support for the administration to move the detainees that have been cleared out for transfer,” Daskal says. But while the NDAA may provide the president with substantial support for the prison’s closure, primarily by barring detainees from being transferred to the United States, some experts warn that Obama will need to spend a lot of political capital to actually succeed. “During the first two years of his administration, Obama’s party controlled both the House and the Senate, and that was the best time to get this done,” Charles Stimson, a former deputy assistant secretary of defence for detainee affairs under the administration of George W. Bush and currently manager of the National Security Law Programme at the Heritage Foundation, a conservative think tank here, told IPS. At the same time, Stimson noted that the release of the Saudi and Algerian detainees may hint at a possible strategy the White House could consider if it truly wishes to close the prison by 2016. Stimson also admits that Obama was handed a particularly complicated task in trying to close Guantanamo. One of the most significant problems faced by the Obama administration is the large percentage of Yemeni citizens currently held at Guantanamo. So far, the Yemeni government has been unable to provide the U.S. with guarantees that it will be able to control its ex-detainees. Yet some warn that policymakers shouldn’t overstate the obstacle posed by the Yemeni government.